Here it is, the first old camera I bought when I started collecting again in 2007. 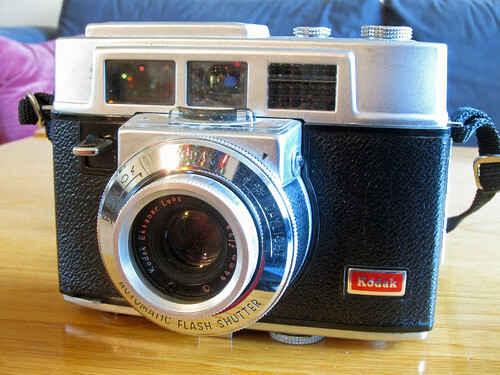 The 1962-66 Kodak Automatic 35F was part of the 1959-69 Automatic and Motormatic series of 35mm viewfinder cameras. 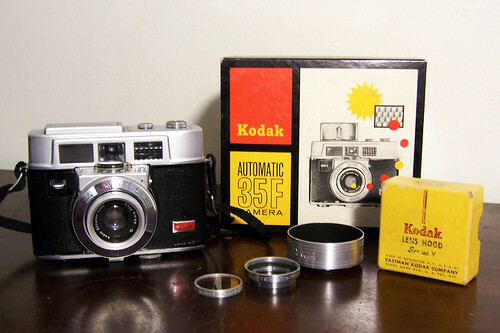 Featuring a coupled selenium exposure meter, they were Kodak’s first autoexposure 35mm cameras. They were also the last 35mm cameras Kodak made in the United States. The entire range featured Kodak’s good 44mm f/2.8 Ektanar lens. Some say the Ektanar is a Tessar, others say it’s a triplet. Either way, it’s Lumenized, meaning it’s coated with radioactive thorium oxide. These cameras used leaf shutters, mostly (as on this Automatic 35F) the Automatic Flash shutter with speeds of 1/40, 1/80, 1/125, and 1/250 sec. The exposure meter sets aperture against the shutter speed you choose; there is no fully manual exposure control. The F in 35F means flash – you can insert peanut-sized AG-1 bulbs into the top of the camera. When you turn the big dial around the lens to the flash position, the flash synchronizes with the shutter. Every camera in the Automatic line had a Motormatic companion that added a spring-loaded automatic winder. I’ve never shot this camera. The light meter is dead, and the film pressure plate is broken off. I’m not sure why I even keep it. It’s probably because it it came with accessories in its original box – and because of nostalgia. You see, an Automatic 35F was part of my first camera collection. I bought it while I was a teenager, probably for five bucks at some yard sale. But I did shoot that one, although I waited until I was in my thirties. I was in a nightmare marriage then. After a particularly bad period in about 2000, I think, I wanted to get away and clear my head. I’m pretty sure my wife wanted to be rid of me for a little while, too. We agreed that I would take a vacation by myself. 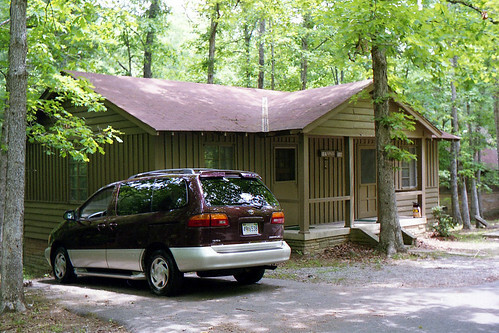 I drove to Tennessee and holed up in a cabin in the woods. I took few photographs in those days. 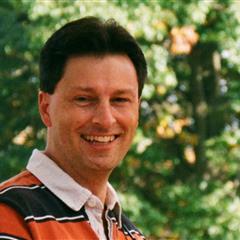 My wife was a mighty good professional photographer, and I ceded nearly all picture taking to her. But I wanted to do things on my trip that I knew I would enjoy, and I remembered enjoying shooting my old cameras when I was younger. So before the trip, I searched through my boxes of cameras for one to shoot. I had probably a hundred cameras then, most of them Brownies and Instamatics and the like. But I did have a handful of better cameras, including an Argus A-Four and this Automatic 35F. I shot the Argus when I was in high school (see the photos here), so I decided to give the 35F a whirl. 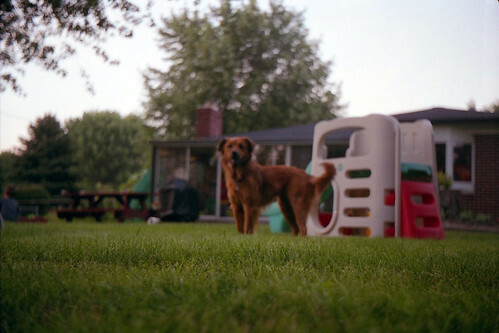 I shot a test roll first, probably Kodak Gold 200, around the house and at a family reunion. I had no idea what I was doing. My memories are dim, but I think I set the shutter to 1/250 sec. and hoped for the best. Unfortunately, on this very cloudy afternoon, 1/250 sec. set the aperture wide open and gave me a very shallow depth of field. It left little margin for focusing error, leaving Gracie, who would have been about three years old then, behind a very thin focus patch. Just check out that area of razor-sharp grass in front of her. As afternoon faded into evening, good exposures became difficult. What’s interesting about this shot of Sugar is the bokeh the lens created. When I scanned these negatives, I discovered several photos of my young sons when they were about one and three years old. I was so happy to find them, as I have precious few photographs of my boys from the years their mother and I were married. I thought long and hard about breaking my rule against showing photos of my sons online, because some of those photos are wonderful. 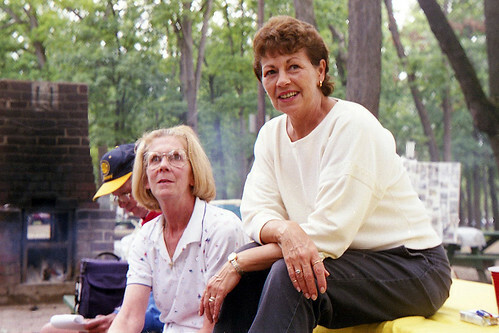 Fortunately, I did get this one great photo of my mother and my cousins Sharon and Doyle at the family reunion. It’s an especially good photo of Mom. By the looks of it I had decided to try slower shutter speeds, through which I stumbled into greater depth of field. I still had no idea what I was doing. I dropped a second roll of film into the 35F before I headed south to Tennessee. I mapped my route using a Rand McNally atlas, which seems so quaint now. 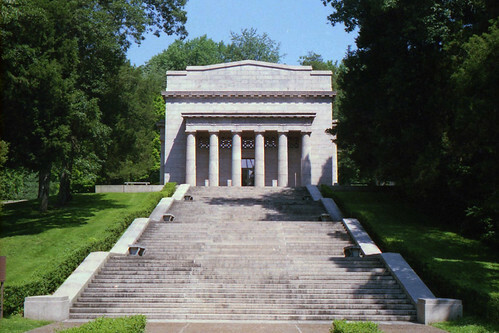 I had no idea that I would pass by the birthplace of Abraham Lincoln in Kentucky, but I was certainly thrilled when I did. I stopped, explored, and got a couple photos. This is the building in which a replica of the birthplace cabin stands. I visited again in 2011; see those photos here. I stayed all week in Cumberland Mountain State Park, in this cabin. That’s the minivan I drove then; it was an execrable automobile. I returned to this park with my sons in 2011, and brought my Zeiss Ikon Contessa LK. See those photos here. 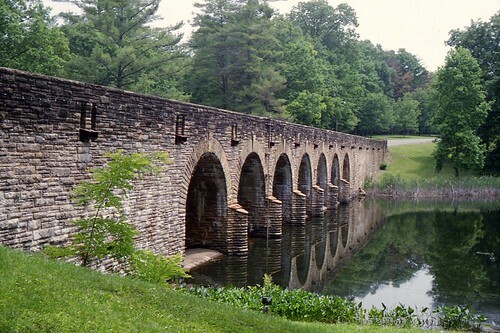 This bridge and dam over Byrd Creek was built by the CCC. See more photos of it here. While driving to and from Tennessee, I stopped several times to photograph old cars I found. I do believe this was the first time I ever did that, and now I make a real habit of it. 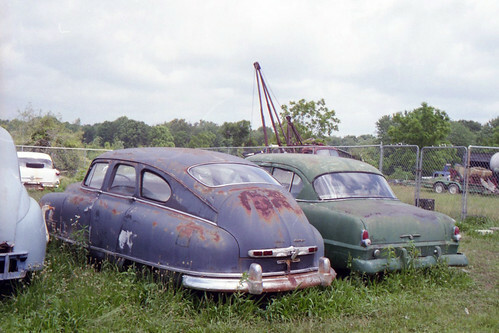 I shared more old-car photos from this trip over at Curbside Classic; read about them here. See more photos in my Kodak Automatic 35F gallery. It’s hard to remember after so many years just what I thought of using the Automatic 35F. I was such a photo newbie anyway that my impressions would have been poorly informed. I sold my camera collection a few years later, for complicated reasons. After the divorce, I wanted to rebuild my life around my sons first, but around things I enjoyed second. Remembering the fun I had with my old camera on that Tennessee trip is why I started a new collection. (Remembering the fun I had driving the blue highways on that trip is part of why I started exploring the old roads, too.) I deliberately bought this Automatic 35F to start my new collection. The dead exposure meter rendered the camera useless and taught me my first lesson in the pitfalls of buying old cameras on eBay. I had been buying other cameras, too, and started shooting with them and never looked back at this Kodak. And now that I’ve shot so many other cameras, I don’t find this Kodak all that interesting. I could be charmed into buying another if it worked and I happened upon it for a few dollars. But I’d rather keep shooting with my favorite old cameras, most of which are better specified and all of which are easier to use than this Automatic 35F. But I’ll never forget the joy of discovery I experienced shooting my old Automatic 35F. It’s why when I started collecting again I focused on better cameras. I’ve had the time of my life exploring the world of vintage film cameras and learning what kind of camera I like to shoot best. That a Kodak Automatic 35F sparked that joy is why one will probably always have a home in my collection. Then check out my entire collection. 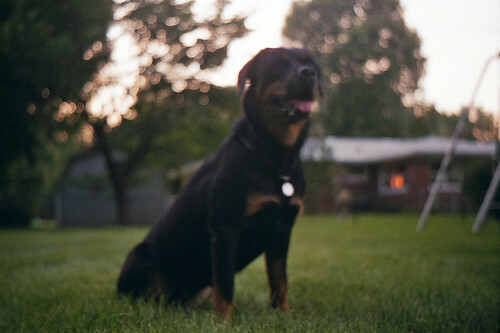 Here are my 3 best photos with my Kodak Motormatic 35. Always glad to see your posts. The lenses in these cameras were pretty darned good. I have the Motormatic version which while the meter needle moves the shutter seems not to work. Like you I haven’t felt much of a drive to get it working. It does look like that lens is pretty good. I imagine this was quite a step up from the box Brownies. I think that I prefer the non-automatic cameras with similar abilities from that era like the Ponies, and Sillettes. I’d shoot my Pony before an Auto/Motormatic any day. Less to break, and the Pony lens seems just as good as the one on this Automatic.